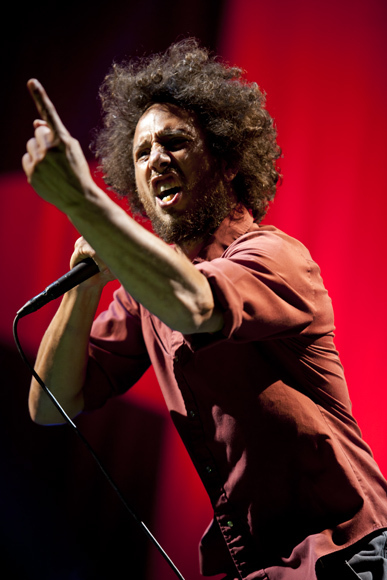 With Saturday’s rebellion-themed LA Rising now over, a few interesting details about the future of Rage Against the Machine have emerged—including the confirmation of upcoming new material from the reunited political rock outfit. Bassist Tim Commerford said in a brief pre-show interview with Rolling Stone that RATM has gone beyond rehearsing their old classics and moved onto some fresher material that is currently in the building stages. “We were jamming, and Zach was throwing freestyles. That’s how we write music. To me that’s exciting,” Commerford said. In addition to the aforementioned new material, the bassist also said that RATM has “significant plans” ready for the next two years, confirming that the band that the world needed most during the Bush era will be around for the post-Obama era. Commerford’s confirmation of new material being in the works harkens back to vocalist Zack de la Rocha’s December announcement that a new album from the band is in the works. A recent KROQ interview with Tom Morello stated the opposite, with the guitarist saying that “beyond sort of working out a concert this year, there’s nothing else on the schedule” for the group. The band has not addressed Morello’s contradicting KROQ comments, and despite Commerford’s vote of confidence in the band’s creative dynamic, there is no confirmation regarding further details about new material from RATM.